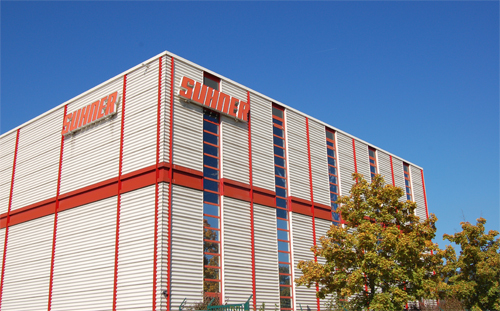 Otto Suhner GmbH, based in Bad Säckingen, can look back over successful activities spanning almost 100 years. The company is specialized in the machinery and tooling sectors, also providing expertise for efficient and surface machining. Other key areas of focus are the LCA modular system, which allows cost-effective rationalization for drilling, thread tapping and milling units, as well as drive and power transmission elements. The plant in Bad Säckingen was founded in 1928 and has been trading as “Otto Suhner GmbH” since 1932. In 1992, the company moved to its current premises at the Trottäcker industrial park. Around 135 staff members are now employed there. Of these, around 20 to 25 work as field service representatives all over Germany. Abrasives, electrical and compressed air tools, as well as machines with flexible shafts for professional surface machining are produced in low production volumes. Standardized and customized drive and power transmission elements for specific customer requirements. Modules for cost-effective rationalization for drilling, thread tapping and milling units, etc.